This is a community for fans of the band Echo & the Bunnymen! Pre-breakup Albums: Crocodiles (1980), Shine So Hard EP (1980), Heaven Up Here (1981), Porcupine (1983), Ocean Rain (1984), Songs to Learn & Sing (1986), self-titled album (1987). At the end of 1988, McCulloch left the band to pursue a solo career; the rest of the band decided to continue without the singer. Tragedy hit the band in the summer of 1989 when de Freitas was killed in an auto accident. Ian McCulloch solo albums: Candleland (1989), Mysterio (1992), and Slideling (2003). McCulloch and Sergeant formed Electrafixion in 1994, releasing their first album in 1995. Echo & the Bunnymen reformed w/ McCulloch, Sergeant, and Pattinson. Albums: Evergreen (1997), What Are You Going to Do With Your Life? (1999) without Pattinson, Flowers (2001) without Pattinson, Live in Liverpool (2001), and for 2005's Siberia, McCulloch and Sergeant joined producer Hugh Jones for the band's most classic effort since their 1997 comeback. PLEASE REVIEW COMMUNITY RULES BEFORE JOINING AND/OR POSTING. Please be nice and respectful to all members. Please place large images and big posts behind an lj-cut. Try to keep all posts related in some way to Echo & the Bunnymen. Just trying to spread the word and the Bunnymen love out to the world. 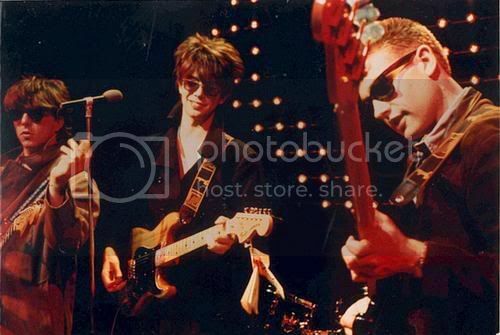 ^_^ I encourage you to post your Bunnymen-related stories of live shows, post photos, icons, anything at all!